Sad to say that this will be my last post with Sin City, I had so much fun designing for them and I just love all their products! Today as a farewell I used the stamp from the Anime Fairies Art Rubber stamps and Plate of Rubber Time stamps to create my mischievous sparkly sprite card. I knew I was going to use my ColourArte Twinkling H20's to color the wings in so first I dampened a scrap piece of watercolor paper and then spread the H20's out with a paint brush. Then I squirted some water onto the paper to really allow them to blend together. Before the paper dried and I splattered the colors on top letting them blossom and create a delicious tie-dye look. Once the paper dries, you can really see the sparkle! Then I stamped the wings and cut them out. I did leave off all the fanciful swirls the wings had, but there was no way was I even going to try and cut them out. I also stamped 2 sets of each wing so I could double them up. 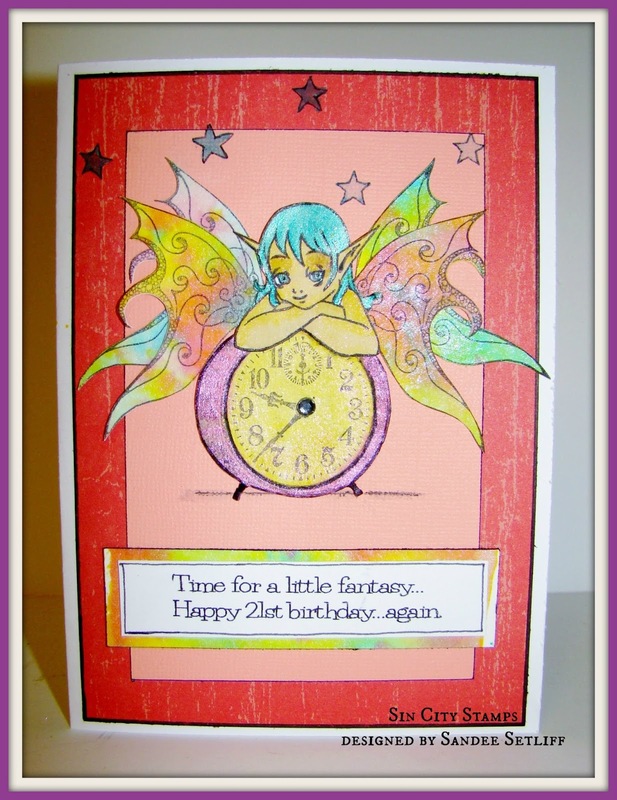 Next I stamped the clock and the fairy leaving off parts so that I could create the look of her draping herself over the clock and again, used the same colors to embellish the images and added the Radiant Gel for her hair. 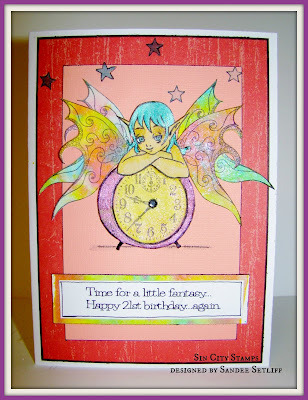 Adding a small rhinestone in the center of the clocks face to complete the sparkle theme. Then it was just a matter a layering everything and gluing it down. 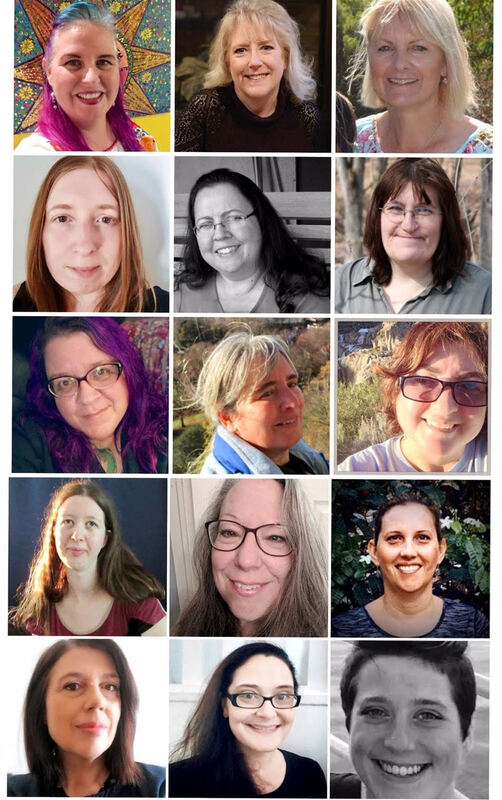 I look forward to keeping in touch with the Sin City Design Team members and all their fabulous creations! Sorry to hear you're leaving. :( You are such a talented lady!! Take care Sandee & enjoy your retirement from Sin City. So sad you are leaving. This is so cute and love the colors. This is so pretty! You are one talented lady!! It was great being on the team! Sorry you are leaving . But I understand and you are a great designer. Love this project and the sun City stamps. What a cute little sparkly fairy!! Twinkling H2Os are so much fun to use and my go-to anytime I want to add a bit of sparkle. 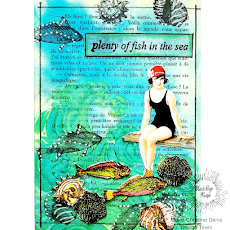 Will be bringing them with us on our artcations, love to use them on mermaids too! Love this card! Its bright and colorful and it's sparkley ..like you !! Can i have it? J/k will miss seing your posts every other Wednesday. . But I AM SURE..you are on to even more wonderful things talented lady !! What a fun and colorful project. Sorry to hear you are leaving, but I am sure you will continue sharing your talents with us. Best wishes to you! Thank you Barbara, loved being on the team with you!